Found 30 entries in 0.071 seconds. The metal of Shardblades. Cultivationspren versus honorspren, for example. Are they different metals? Are all orders the same alloy, essentially? Yes. There's a little asterisk on there, but not in the way you're asking... You could call those all the same alloy. Because the mixture to different spren is different, I think that you could argue that each one is its own alloy. So, different proportions of tanavastium? Yes, but it doesn't quite work that way with these magics, right? I'm going to say that's up to the individual cosmerologist who is in the world, the arcanist, defining it. You would be able to find enough differences to legitimately call them different alloys if you wanted to. Would you say different ratios of the same two metals? Yes. They are not going to have a third one in them, if that's what you're asking. But it doesn't quite work that way. Like, if you were going to take brass, you could measure the exact percentage. In this case, it is a thing; it's not like you could divide it up and split them apart, because they are a thing. And that thing would be called one thing. But you won't say what that thing is called? No, I won't say what that thing is called. But I think you and the 17th Sharders and folks that are dividing them would prefer to call them ten different things, and I think their nomenclature would be relevant. You said that it's theoretically possible that Hoid could have alloyed the lerasium bead with another god metal to acquire another magic. Has he done so? He has not. Because there are certain things that were preventing that from working. If Ruin had split into 2 shards, would one, zero, or both of those shards have been capable of making atium? Does this change depending on how it splits? Not necessarily. And it would change depending on how things split. In allomancy, normal metals are simply a tool that channels allomancers already existing connection to the power of preservation, which is why non allomancers don't get powers from digesting metal. But if I understand it correctly, god metals are an exception, since they are a form of a shards power, burning them directly uses the power stored within. If I have this right, how come a normal person can burn Lerasium, but not Atium? Or could they, and no ones thought to try? But if that was true why are there Atium mistings? Suffice it to say that what people both in the books and out think about the god metals has some holes in it. I'm curious. 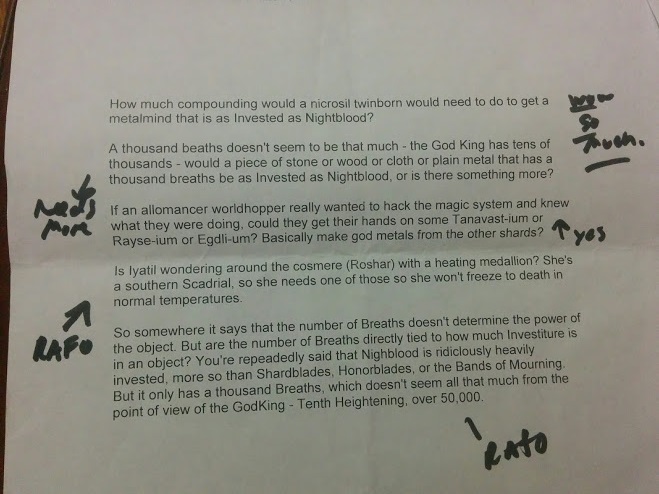 Are any of those rare metals from Mistborn on any other world? So, not those exact metals, unless they've been taken off-world. But there are other metals like them that you could find. So they could have Allomantic lore? Let's just say it's not a coincidence that you find Investiture manifesting as metal on other places. Such as Shardblades, as well. Well I think the question Sharders had was if it's Invested, how can people Push and Pull on it. That was the struggle. Atium breaks a lot of rules, in the same way that you will see other things break rules. Atium plays weirdly. When you get distilled Investiture, you're starting like-- My kind of rule for myself is it's kind of like when you start going on the quantum level, the rules just start playing weirdly. Because it's like, what Realm does atium exist in-- is another thing. Because-- Pure Investiture like that is like a mini black hole, right? It's like existing in three Realms at once. Kind of, and things like that... There's lots of weirdness. The writerly answer is there is lots of weirdness because when I built atium, I didn't have the rest of the cosmere built, right? And so it breaks a lot of rules that I later set up that everything else has to follow, right? So the writerly answer is we just have to accept that atium and lerasium and some of these other distilled Investiture things are going to play very weirdly with the magic systems. But that's okay. Nightblood will too, and some of these things that were built even after the cosmere was coming together. If a Worldhopper were somehow able to spike themselves with god metals from each shard world e.g. Honor/Cultivation/Odium spike, would it be possible for them to make a miniaturized version of a new shard, or would they just gain powers granted to them by the spikes? Can an Allomancer burn any god metal? Or is it specifically Preservation and Ruin? That is actually a RAFO. There's some funkyness going on there. Is aluminum the godmetal of Adonalsium? Are there equivalents to god metals for Shards on planets other than Scadrial? I also got confirmed that the metal that spren turn into is god metal. Footnote: Unspecified question by yulerule. Atium and lerasium are their own special ways of Investiture, of using it. Do the other Shards have those, that even within their magic systems are unique just to that one Shard? Can you tell me anything about any of that? You might see some of them some day? I think, I know you've seen at least one, but people don't know what it is? One person's asked me a question about it, so somebody's figured it out but, yeah, there are things like that in other worlds. Kind of, distilled essence of Shard, yeah. Did Adonalsium have a god metal? Are you ever going to release the other 16 alloys with the god metals? Did you decide? Are you not releasing them because you're still trying to-- you don't want to pin yourself down just in case? It's part that, but part I know. The more I release, the more distracting it is from the stories and it also prevents me from using them in the stories as reveals. What would happen if you alloyed a metal with atium and lerasium? So, you've seen some of that. It would be a further extrapolation on that concept. Could you soulcast atium from god-metal into god-wood? Soulcasting atium would take a heap-ton of Investiture. You'd need a huge source to power that. Would an Honorblade be considered as an equivalent to a god metal? There are some who would draw that parallel. What happens to god metals when a Shard is Splintered? And atium and lerasium stayed unaffected when they merged? Lerasium and atium that existed before were unaffected. Will we see more of the god metal alloys in the future? Are they able to make a Hemalurgic spike out of a god metal? Or does that not work? RAFO. We will be releasing a Hemalurgic table before too much longer. I was also wondering if... I just finished reading the Ars Arcanum in the back of Bands of Mourning and I heard it mention that god metals could be alloyed to give different abilities or traits. Could you give an example of one? So, you could alloy lerasium with certain metals of the sixteen in the table and get, if you had just enough lerasium, it would make them a misting of those powers. Are the requirements for a shard to Invest in a shardworld what causes the manifestations that we see (spren on Roshar, Lerasium/Atium/Harmonium/'Trellium' on Scadrial, and Tears of Edgli on Nalthis) or are these phenomena the by-product (or intentional action) of the Shards' Investing themselves? *Written:* If an Allomancer Worldhopper really wanted to hack the magic system and knew what they were doing, could they get their hands on some tanavastium, rayseium, or egdlium? Basically make god metals from the other Shards? Uh, yes. This is possible. Footnote: Needs image attached to entry 4067. Click here. Before Preservation locked up Ruin, or whatever, or if Ruin had won. Would atium exist? ...There are timelines where there would be no atium. ...So if Harmony exists, does atium exist? So it was only part of Ati's body and not part of Harmony's body. There is no atium, there is no Preservation any longer, there is no Ati. All the physical manifestations--solid physical manifestations we've seen of Investiture has been metallic. It's been atium, lerasium, Shardblades. Is that just a coincidence? It's intentional so we're not going to see Investiture wood or Investiture plastic? Right, I mean technically, like, what do you call the Aethers? Those are not metal. But I do it as metal intentionally. They could be a metal with very low boiling point. Well we've had liquid, we've had gas, the solids all seem to be metallic, so. Is Shardplate made of the same material as Shardblades? Is there a difference in material between a "dead" Shardblade and a living one? You can generally look at all three as being the same material. Godmetal alloys in Era 1 feel a bit like an unfulfilled promise, can you tell us about the attribute stored in a metalmind made out of any atium/lerasium alloy?